A Yazidi Kurd from Sinjar who was abducted by ISISL, pictured here in Mamilyan Camp for internally displaced persons in Akre, Iraq. Karim Asad Ahmad Khan, Special Adviser and Head of the UN Investigative Team to Promote Accountability for Crimes Committed by Da’esh/Islamic State in Iraq and the Levant (UNITAD) briefs the Security Council. 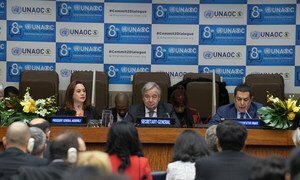 The role of the United Nations Alliance of Civilizations has never been more relevant to the 2030 Agenda objective of “building more peaceful, just and resilient societies,” Secretary-General António Guterres said on Monday, the opening day of the eighth annual Global Forum.